Before I introduce Anita Åstrand to you I would like to underline her importance to this master class. Many opera singers know about diaphragma , which is an important muscle to breath in, but they show no knowledge about the lower abdominal muscles. These muscles are important when you breath out to sing. It is very sad but true that most people have not trained the lower abdominal muscles. There are several muscles who belong to the lower abdominal muscles, one of them is the pyramidalis. Kirsten Flagstad worked with these muscles while she went to the Anna Behle Institute and Anna Behle was Elsa Österling´s teacher. This is when the story of Anita Åstrand starts. 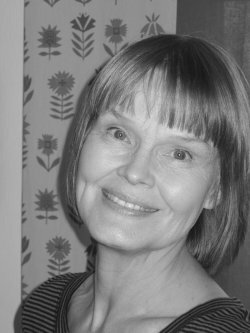 Anita Åstrand is Elsa Österling´s successor at Academy of Music and Drama at Gothenburg University where she teaches the special Elsa technique focusing on greater body awareness to free creativity and vocal possibility to enable and freer voice for actors and singers. Anita Åstrand studied rhythmics and physiotherapy and her studies are influenced by eastern-Asian medicine. During her studies Anita also attended Elsa's summer classes and graduaded at Dalcroze rhythmic school in Stockholm. In 1965 Anita was already working as Elsa´s teaching assistant while she was working as an educator in rhythmics. Anita is the one who deepened Elsa's special Elsa technique and teaches it from the physiological point of view. The functionality of this Elsa technique and her interest in anatomy made her to go on in this direction and to keep herself up to date with it even when she had finished her studies in rhythmics. That is why Anita provided a anatomic and physiological basis for the Elsa technique .